No kidding. 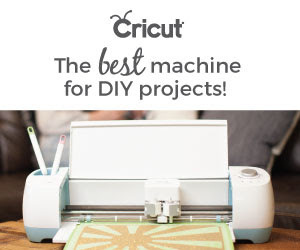 Recycle a bed sheet, a few t-shirts, a sweater or 4, buy durable nylon rope,… or simply crochet with some wool yarn…. and make one or more modern area rugs in a dash. I am sure you’ve all seen the grass crochet rug that we’ve featured a while ago?!! Today, I am going to feast your yes on some other great ideas. For most, you really don’t need a pattern, but a load of creative inspiration instead, and patience. However, some… yes, … some rugs …. are really fast to make. You don’t even patience. 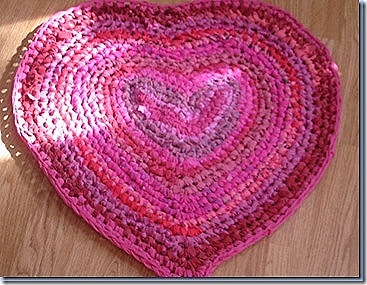 See the lovely heart rag rug below? It was made in a day! 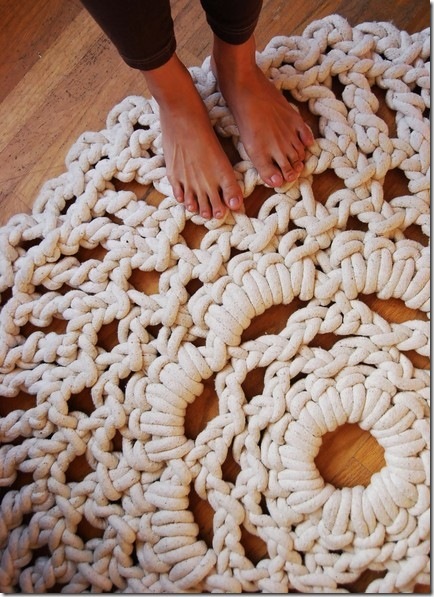 Great Crochet rug, heh?! The flowers and leaves that form the rug are hand-crocheted and then sewn by hand to a synthetic net backing. 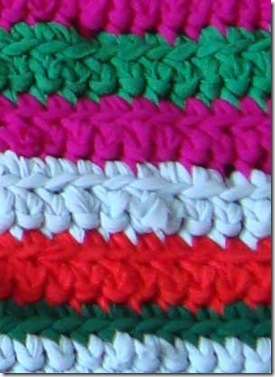 Rope yarn for outdoor use and in wool for indoor use (i.e. 100% polyolefins or 80% new wool, 20% polyamide). 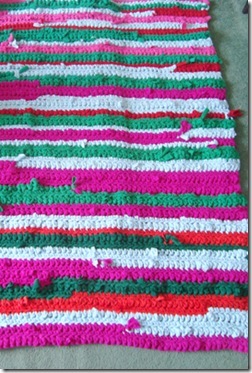 Rug by HandmadePretties. No longer for sale. 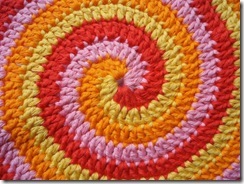 Once you know how to crochet spirals, which is not hard at all. made in a day: wow! 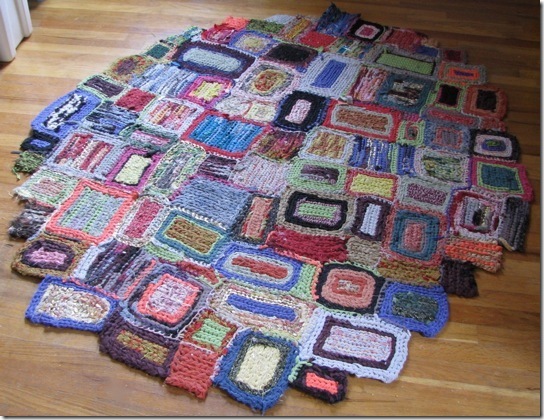 Not sure if it is crochet on top, but I love the look and thought it would make a great crochet rug…. a crochet owl rug and classic sock monkey area rug. The first one is by AdaIha at Tumble. The second by by Peanut butter Dynamite on Etsy (“http://www.etsy.com/listing/36841135/crochet-sock-monkey-rug). 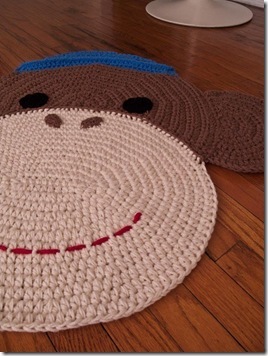 The sock monkey rug is 31.5″ tall X 28” wide. These rugs have been sold. However, the crochet patterns of both the owl and the sock monkey rug could be reverse-engineered if you are a bit crochet savvy. If you are interested in me doing so, I will write you a pattern for either. Leave me a comment below. NEWSFLASH #1: my sock monkey cup cozy crochet pattern is now in the patterns shop for sale, or learn more about this easy sock monkey knitting pattern. NEWSFLASH #2: rather than selling/giving away the pattern for someone else’s design, I decided it would be better karma (and cuter) to design my own rugs. So, I did. My super-adorable sock monkey rug demo model is now finished and the crochet pattern for it will be posted on this blog September 2015. Stay tuned. OK. As you can tell, my basic area rug research is now done. Let me ask you: Which rugs do you like the most? I like the idea of starting with just a basic shape, like a circle, and then let the project evolve into something. I think that’s what I’ll do. And looking at all these amazing contemporary designer rugs, I also know that I’m going to have the project take some time. As well, I like to bring more meaningful symbols in my life, so I think that I’m going to crochet a giant OM symbol, with other swirls or mini-symbols around. I have been needing an area rug for some time now. We have a mix-matching Mexican rug, which I had covered with calico fabric last year, for some comfort to the eyes and warm feet. However, it looked like a dust cover over an expensive rug, rather than a ‘rug’ all by itself. So, now that I have a base, and a color that I love, I have to come up with my rug design for this winter, or actually, sooner. I love to use my growing stash of recycled socks for this purpose, but, I’m afraid that there won’t be enough of them as they are used up in so many (ongoing) craft / DIY projects now, some of which I never told you about, such as my peace symbol handbag…. Next Spring I’ll feature it. 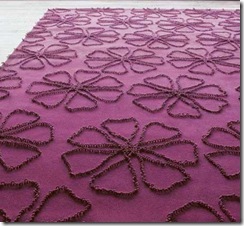 tagged: modern area rug, contemporary area rugs, crochet rug patterns, area rugs for kids rooms. Love ’em all! 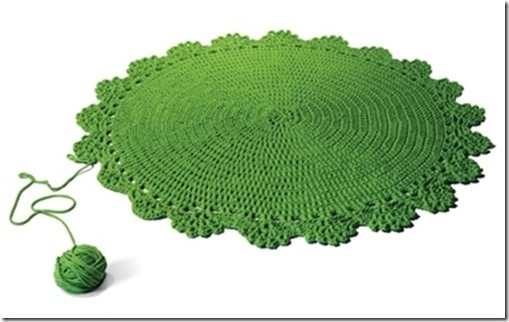 Especially the green yarn one and the rope one, they look like gigantic doilies. I’m wondering if smaller rope would make something less bulky…and smaller rope is cheap. I can see this done in some shiny nylon clothesline cord for a neat doily style rug. Gotta try it! I’ll post it when I do! Very cool collection of rugs! That was fun! OMG! 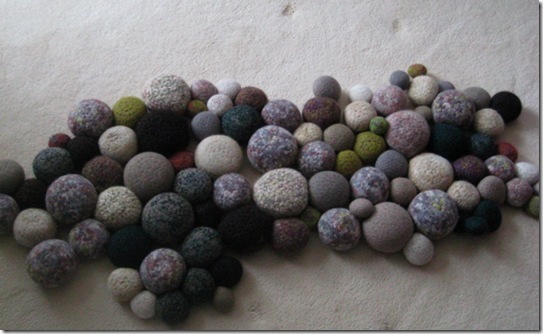 MAKE THE PEBBLE RUG! ITS AHHH-MAZING! Thanks for putting all of those together… gets the wheels turning! Oh, I love them all, really. 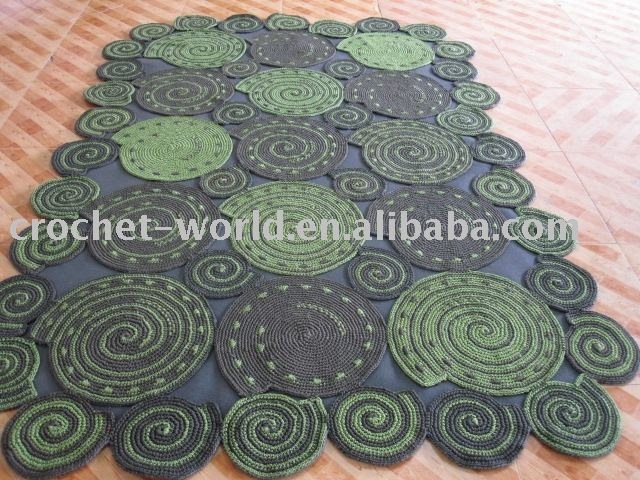 In a way, I want to make all of them, and in a way, I want to make something totally new, like an OM rug. I can just see it. Really cool. You have me curious about recycling a bedsheet…I’ve seen plastic bags made into things, I imagine you’d prep it in the same way? I saw a tutorial that basically has you fold it up (the bag, but I’m sure a sheet would work too), then cut “fringe”, leaving a few inches at the end. Then you cut diagonally in a way that gives you one long strip. 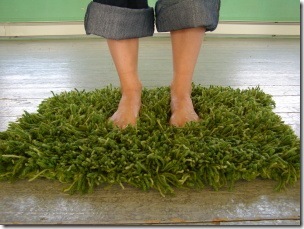 I think I’ll have to try this with the rope rug. I’ve been wanting to do something like that for a long time. Thanks for the newfound inspiration!! 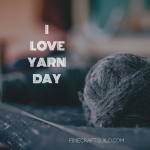 I think I would make yarn first, like one would make t-shirt yarn, which is essentially long strips of fabric. I would probably cut it zig-zag to avoid having to stitch all the strips together. To determine the width of the strips, I would experiment first before I’d cut the whole sheet. 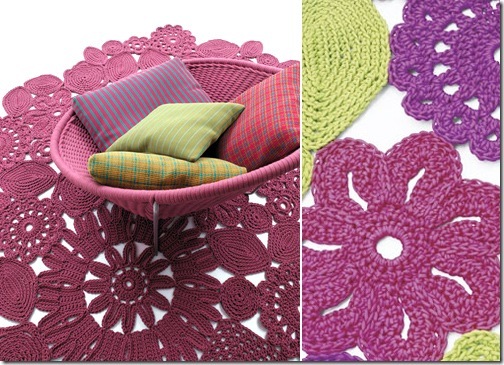 You can crochet it with your hands/fingers, or with a large crochet hook to gain contemporary look. 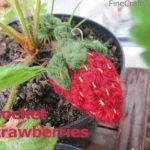 Crochet patterns allow for loads of originality in shapes and patterns vs simple breading. GOOD LUCK, and… DO SHOW US THE RESULTS! 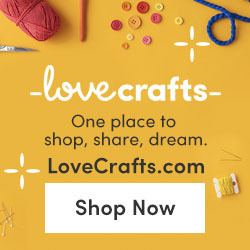 We *** LOVE *** TO POST ORIGINAL RECYCLED CRAFT & ART! love the towel rug. i’am going to make it tomorrow , one for me and one for my sister. she will go nuts when i give it to her <3 . thanks again. I love the sock monkey and owl rug! Where would you find a patter for something like that? I would love the sock monkey rug instructions please! I’d also love the sock monkey pattern! :) Please & Thanks! OK.Devon. I’ll do my best. I’m working on a sock monkey coffee cozy and a sock monkey handwarmer patterns at present. When they are done, I’ll move onto rugs! Absolutely LOVE the monkey rug!! Could you please send me the pattern for both. Thanks! I am absolutely crazy about sock monkeys! This rug was adorable. Would love to make it! Could you please send the pattern!! I love the owl and sock monkey rug. Could you send the patterns to me? My son’s would go crazy over them. The sock monkey is so cute and perfect to match baby’s jungle theme. I would really appreciate it if you could send it my way as well. I like them all but I was interested in the owl and the sock monkey rug.Also, you do very lovely job on all of your work. Thank you for your kind words, Andrea. I am working on designing a sock monkey rug + pattern as we speak. 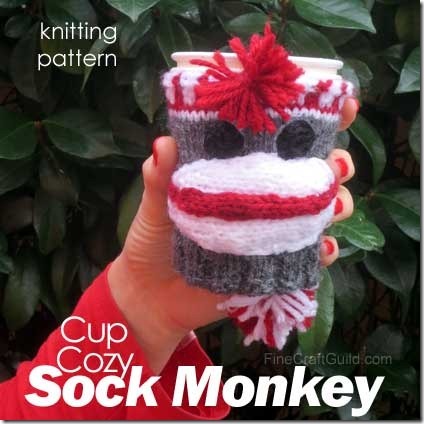 For the time being, look at the other sock monkey patterns I’ve just developed: sock monkey coffee cup cozy and, to be posted this week: sock monkey gloves. Soon, that rug…. 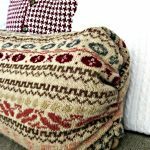 As for owl patterns, there are MANY other owl patterns and designs on this blog, some of which you could modify to become an owl rug. Use the search-button on the top right to search for the various articles on these topics. Will the rug pattern be posted here or will you email it? would like to have your sock monkey rug pattern. My grandson loves monkeys. The monkey and owl rugs are AWESOME! I would love for you to write up the pattern for them. I know a little boy that would love the monkey and my mom would love the owl. Please Please Please write them up. Hi Shelley, I am finishing my Sock Monkey rug and the pattern for it today. I think I’ll take a break over the holidays, and do the owls in the new year. Merry Christmas, Happy New Year !! I love the sock monkey rug. I am decorating my son’s big boy room all in monkey’s and would love to make this for him. 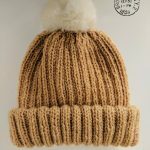 Please send me the pattern! Thanks so much! 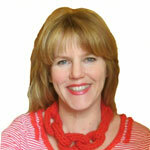 I am looking forward to getting the patterns for the sock monkey and owl area rugs. Please keep me informed. thank you. I would love the pattern for the owl rug. My sister in-law would die for it. Sock monkey pattern please, I am decorating my twins playroom all in monkes and this would be fabulous. I would LOVE the sock monkey rug pattern and the rope rug pattern Please. 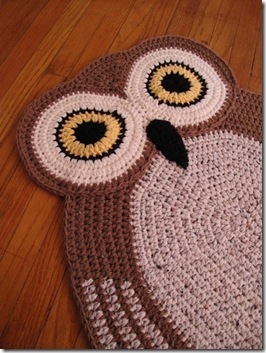 Will you please email me your owl rug crochet pattern. Thank you. Would love pattern for sock monkey. I would love the sock monkey and owl pattterns for my grandson. Please share! Just joining in the chorus ….. Love the owl and sock monkey rug! Can’t wait for the patterns!! would love the sock monkey rug pattern. My great nephew having first birthday in february, would make great give from his great aunt. I love these! I would love the pattern for both! Thank you so much! I can’t wait to make them! My son is so excited! I’ll have to start with the monkey for his monkey-themed bedroom! Would love the pattern for the sock monkey rug. Daughter is expecting first baby and has always been into sock monkeys. Would love to have the pattern for the owl rug, have a friend we call the owl and I would love to make one for her. Thank you. I absolutely love the owl rug. My husband and I are having a baby girl due March 1st. We have decorated her room in an owl theme and have been looking or a rug to match. I am finding out very quickly that they are not cheap! I never thought of making my own until I saw this one. It is great! I would like to join the other requests for the pattern when it becomes available. Thank you so much! Yes, I would love to have the sock monkey and owl rug pattern. I am making a set of sock monkey for a first time grandma and this would be prefect to go alone with it. Also hoping for the owl rug pattern!! I would like to have the pattern for the owl rug please. Thanks! I would love the pattern for the sock monkey. Hi. Your monkey sock rug is just the cutest thing. 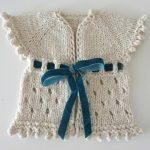 I’d love to have the pattern for it so I can make one for my 5 month old son. Thanks a bunch! I would love the pattern for the sock monkey rug! Could you send it to me? hello, its just wonderful your work, could you please let mi know where i can get the pattern of owl or monkey, still dont know which i like more;) thanks a lot and best wishes for your future projects. Love the Monkey Rug, A friend of mine is having a baby and her theme is monkeys, i’d love to make it for her, please send me the pattern, and the Owl too if you don’t mind, i would greatly appreciate it! Love all your work, Very talented! I would love to have the patterns for the owl and monkey rugs! Love them both! Can you please send sock monkey pattern to me? Thank you! Please send me the pattern for the owl my daughter in law wants it for her birthday. I would love to have the monkey and owl pattern would love to make them for my neice she is doing the baby’s room in monkeys. I would adjust the size of the tshirt strips to the canvas grid (how open it is) and how long you would like to pole of the mat to be. As well, not all t-shirts are of the same thickness. Best is to do a tiny corner of your mat and to see how it comes out. I would love the pattern for the owl rug and the monkey rug they are adorable…. May I please have a copy of the owl and monkey rug patterns? These would be PERFECT for my kid’s rooms. I would love to try the monkey rug, my granddaughter is having a baby and is doing a monkey theme bedroom, how cute that would be for her baby’s room. How do I get the pattern for the monkey rug, looks fun! Sock monkey rug pattern please:) and if you have any tips on crocheting please let me know because this would be my first project! hopefully for my sons birthday!! Just love the rugs. Let me know how I can get the patterns. My granddaughters (3) will just love them. I hope to make each one a different one. Can’t hardly wait to get the pattern. I would love a pattern for the sock monkey rug! Could I pretty please and thank you get the owl rug pattern?? Can’t wait to make it ! I would love to receive the pattern for the Owl rug and the Sock Monkey rug. 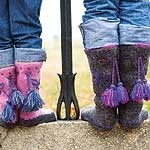 I have two grandchildren that I want to make these for. 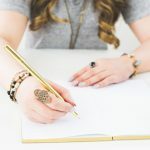 Could you please email me the patterns when you have them available? I WOULD LOVE TO HAVE THE PATTERN FOR THE MONKEY RUG! THANK YOU!! Your sock monkey rug would be perfect for my niece. She’s 1 1/2 and earned the nickname “monkey” within a couple weeks of her birth, even had her 1st Birthday monkey/jungle theme. 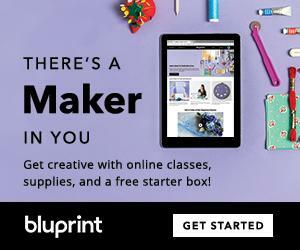 I would greatly appreciate you sharing your talented pattern when you have the chance, thAnk you for your generosity! I would love the pattern for the Sock Monkey rug and the Owl rug! Thank you! i would love to make the sock monkey and owl rugs for my son. Can I gt a pattern? would I beable to get the pattern for the sock monkey rug ? crochet .. it would be awesome to make for my grandson.. I would love the sock monkey pattern please!!! I would love to get the owl and monkey rug patterns please my daughter in law loves owls and she is going through brain surgery right now would love to make her one. I would love the pattern for the sock monkey rug as well! I would love the pattern for the sock monkey rug as well! Thank you! I have a crochet store on facebook and I would love to add your Sock monkey rug and owl rugs to my store…if you could email be the patterns I will put your name on them. I have clients that I have been asking me if I could make them, but I need something to go by. I love the sock monkey and owl rug. Would you be willing to share the pattern for both please. Could you send me the owl and sock monkey pattern please … Thank you .. I love your work . I would love the crochet patterns of both the owl and the sock monkey rug, please. It would be great if you could send them to me. Thank you so much, I am very grateful. I love our owl and monkey rugs ,they are the cutes things I have ever seen. I would love to have the instructions for them. Thank you. love thesock monkey rug. Could you send the pattern to me? Lots of thanks!!! I would love the owl rug pattern. And the money rug pattern, too. Thank you! Hi, I’m very interested in the pattern for the owl rug! Hope to hear from you soon! I have been searching for this rug pattern for some time with no success….so..yes, please!!! I would love this pattern! I would LOVE patterns of the owl and sock monkey rugs! They would be so cute in the kids’ rooms. The sock monkey rug is adorable! I teach kindergarten and would love to make it for my jungle-themed classroom. Thank you! Ahhh…. this rug… I’ve been trying to make one for weeks…. ripping and re-doing… ripping again… searching the internet… ugh…. I just couldn’t get it to look right – but these are perfect! I would like to have the sock monkey pattern. I am wanting a copy of the monkey and owl rug patterns, could you email them to me please? The sock monkey and owl rugs are fantastic and so adorable! My sons would absolutely love them! Are the patterns still available at all? I’m sorry I haven’t been able to find it….. I am interested in the monkey rug and I need its pattern. Thanks Seham. I will add you to the list of people to notify. Hi Darlene, congratulations. How exciting. I’ll let you know when it’s ready. Could you please send me directions for the owl and monkey rug? Thank you for your inquiry. Just follow the Etsy reference. I don’t know if the patterns are available, but I would love the monkey and owl . I have a grandaughter you is in love with monkeys.